The stay was enjoyable but Gulf water was not clear any during our stay. Great property! Beautifully decorated, well appointed, very comfortable and clean. The kitchen has everything you might want and more. The beach is beyond beautiful and the beach chairs were a fantastic perk. Will return to this unit again next year. We arrived early, but was able to complete and receive all paperwork. When house was ready, they called with the key code. Couldn't have been easier! 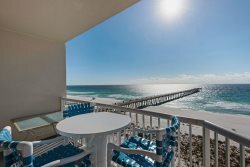 Luna Sea is hands down the best place to stay on Navarre Beach! No problems whatsoever with anything in the house. Beautiful gulf views from just about everywhere in the house. Outdoor shower a huge plus to wash sand off before going inside. Second time at Luna Sea. Absolutely love staying here! My debit card was copied while I was on vacation and your staff offered to do whatever they could to help me with this while I was there. They were very knowledgeable about any of the questions we had. They were great! It was a comfy and had a beautiful view. We love staying at Summerwind! The beach chair set up every morning was the best part of our vacation, we knew no matter what every morning we would have an amazing spot on the beach!! Both the young men that were working when we checked in were very polite, professional and helpful. Excellent, we will be back!